From a couple of days ago. This is a strange little comic I did a while back when a friend suggested a group of us each do a comic-format story based on Batman. This was my take on it. I’ve been thinking a lot lately about the Web-comic format, so I assembled all 10 pages of this story into one long strip to see how it would display on a phone or iPad. Hopefully you will find it amusing. Enjoy! The design they sent me was Midnight Meadow which has a beautiful cover — and is one of 18 new designs they’re offering. I’ve got to say, it’s pretty cool. Seems to be a normal A5 (5.25″ x 8.25″) size with rounded corners and a definite upgrade to the previous “smaller notebook” that I reviewed before. As far as “laying flat” it’s a LOT better than the earlier, perfect-bound small notebook. It seems to have stitched signatures as opposed to the glued-in pages and the paper is good quality. Again, most of what I do in a sketch book these days is with watercolor, and these pages were just a little too thin to accommodate large areas of wash, but still held up remarkably well. Watercolor and ink on the Layflat pages. Just a hint of buckling, but not much! This book would be perfect for pencil sketching, ink sketching, journaling or Bullet Journaling. Pen and ink sketches (fountain pen), some with light wash shading. And of course the great thing about this company is that a portion of the proceeds from every purchase goes to help build schools and support artists around the world. Trying out my new 1959 Sheaffer Snorkel fountain pen with De Atramentis Archive Brown ink. I tend to make my own sketch books, but I have been known to buy a sketch book now and again. So it’s always good to keep an eye out for something fun and rewarding. The smaller and larger books together. 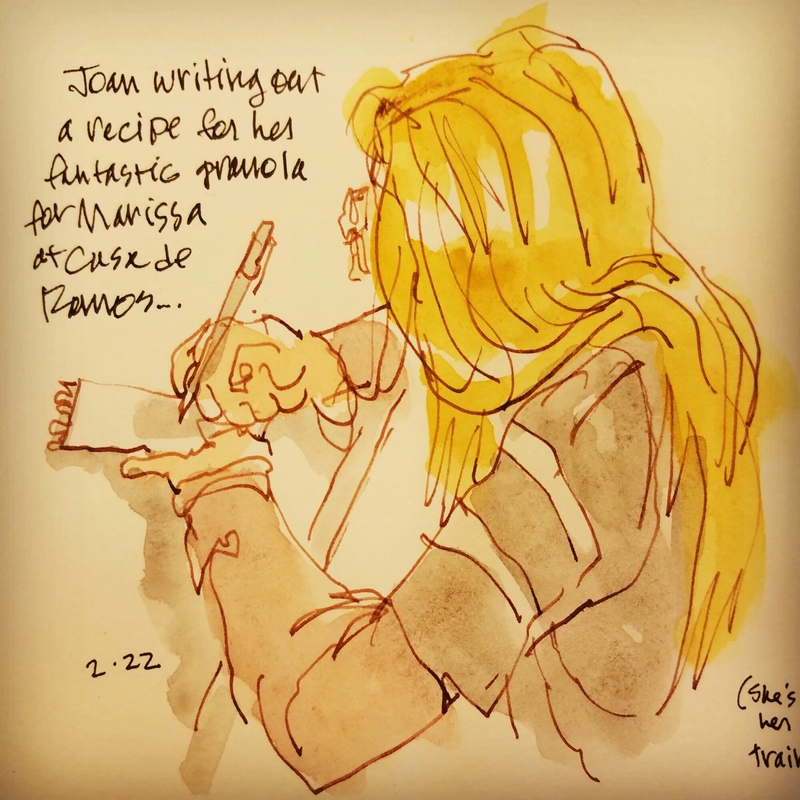 Recently the nice people at Denik asked me to review some of their sketchbooks and talk about their wonderful program that helps build schools in Mali, Africa and Guatemala. The program. Five percent of the proceeds from the sales of their sketch books and journals goes towards three middle schools in three different parts of the world. They work with various non-profits to help fund these schools directly. I love this idea. The artists. Another 5% goes to the artist who creates the cover art for the sketch book — and apparently they get many contributors from around the world as well. So this could be a great way for an artist to get their work seen by people and help contribute to a worthy cause. The books. They seem to be of pretty high quality. The larger, 9″ x 11″ sketchbooks are double-wire spiral bound with sturdy covers front and back. The paper is 77lb (pretty thick), unlined and bright white with square corners. The smaller, 5.25″ x 8.25″ book looks to be perfect-bound with glued-in pages and radiused corners. The paper doesn’t seem to be as thick as what’s in the larger book, probably 30lb or so. The sample they gave me was lined, although, looking at their web site, the smaller book can be ordered with blank sheets as well. Some life drawings in pencil, pen and watercolor in the larger sketch book; some fountain pen ink testing in the smaller journal. Performance. I used these books for a few weeks, trying various media (roller ball pens, fountain pens, markers, pencils, watercolors, colored ink) and was pleasantly surprised how well the paper held up. The larger sketch books have thick enough (77lb) paper to accommodate almost all the media that I use. Pen and pencil worked best, and even marker didn’t bleed as much as some sketch or drawing paper. My only complaint is that watercolor seems to buckle the paper if applied on a large area 4″ x 4″ or more. For small, “spot” illustrations of an inch or two across it seems okay, though. Since my main sketch medium these days is watercolor, this would be a bit of a deal-breaker. But everything else, including using various colored fountain pen inks which didn’t feather or bleed on this heavy paper, was fantastic. Some notes, ironically enough, on how to make a couple of recent hand-made sketch books. Pen and watercolor. The smaller, lined book with the lighter (30lb?) paper accepted fountain pen remarkably well, and only bled through with colored inks heavy with dye. Noodler’s Rome Burning was the ink that bled through slightly when I tried it, while Noodler’s Black and DeAtramentis Archive Black didn’t bleed through at all. And the bleed through with the Noodler’s Rome Burning was minimal and would probably be acceptable for normal writing conditions. The fact that there was minimal-to-no bleed through with fountain pen ink is a testament to the quality of the paper Denik is using, even on this less-heavy weight paper. My only caveat regarding the smaller book is that the perfect-binding won’t allow the book lay flat when opened. But that doesn’t bother many people and may be perfectly fine for note taking or even journaling. I didn’t get a chance to try out their hardbound books, but they look like they might be perfect for Bullet Journaling, which is something I started doing about a year and a half ago (more on that later, perhaps). It’s nice that Denik offers the hardbound books in either lined or graphed paper, since the graphed version would be perfect for use in a Bullet Journal. The bottom line. It seems like a win, win, win: you get a good sketch book, support a fellow artist, and help build schools by buying a Denik sketch book. I really love what this company is doing and wish them the best!